This was our second meetup at our latest, but not the only, venue ‘Fab Lab’ and the ambiance is proving conducive for a more ambitious program to make our beloved 3D Printing Network a sustainable organisation. 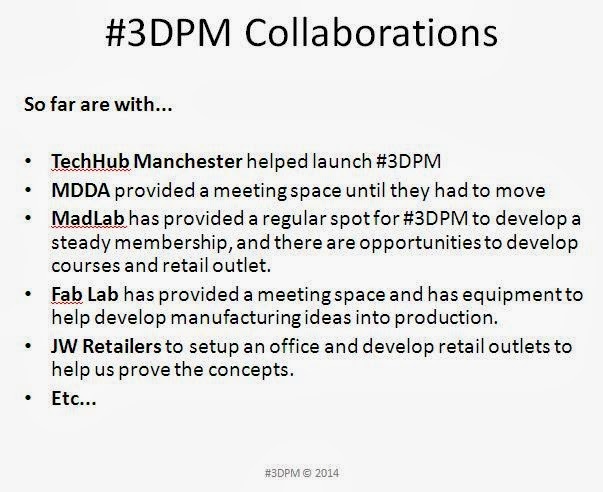 We all know that nothing is for free and we are fortunate to have had some great support over the past few months from Tech Hub, MDDA, Madlab, JW Retailers, Fab Lab and of course, our members. Next month in April, we are aiming to hold regular meetups on the first Monday of the month in MadLab and the third Thursday at ‘Fab Lab’. The exact dates will be on our blog. 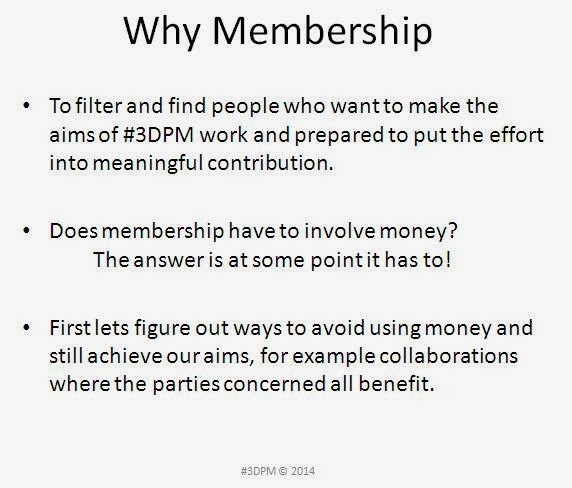 At the Fab lab meetup, a short formal meeting will be had to deal with club matters like we did this time; but because this was the first attempt to put the #3DPM club on a more professional footing our agenda was limited but the response was still very good and very informative. We want to keep the meeting short and deal with the necessary bureaucracy quickly, so we can get on with the more interesting stuff. 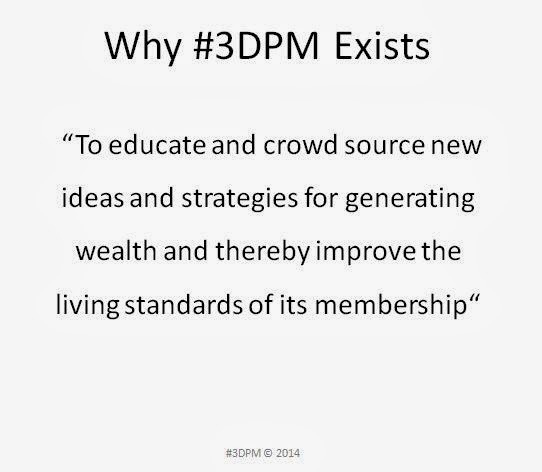 The #3DPM club belongs to its members for its members, and as a club we have set out our operating principles and charitable purpose, and our membership can challenge and improve on them, if it wants. 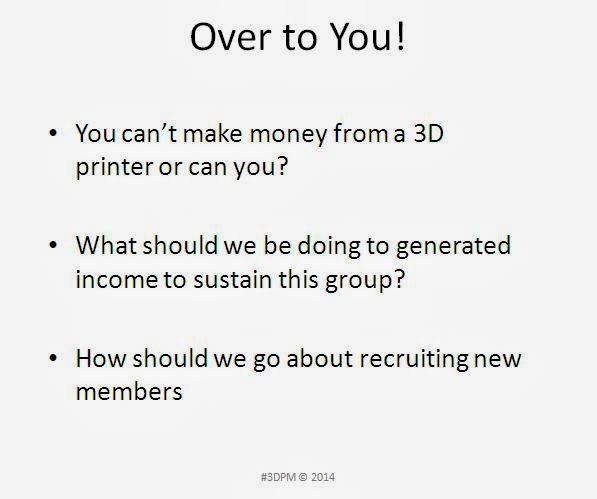 It was at this point that Mark 'the #3DPrinter' handed it over to the attending group whereby an uneasy silence was felt, you can experience it on the video; we have a film crew documenting our development. Then Bill 'the sandman'was brave enough to get the conversation started about what events we could attend so we can advertise for new members. Because the events Bill suggested where half way around the country, Keith 'aka fingers' was quick to point out we should walk not run, that was a metaphor! and to keep things loca,l so John 'the Baptist' chipped in with more ideas nearer home. Big Ben and Keith got into a conversation about the virtues of building 3D printers of rugged construction, which went on for a while until Charles 'the environmentalist' got the conversation refocused back onto the issues raised in the presentation. 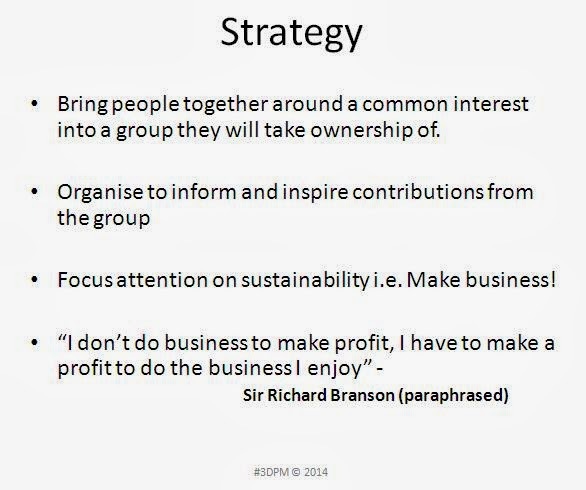 It was nice to see the debate unfold and be constructive; there were quiet a few at the meeting who's names can't be mentioned because I have forgotten them, sorry folks, next months meeting will be better organised with an agenda and proper minutes. Thanks to everyone who turned up to make this another successful gathering; hope to see you all again soon.